"We can travel anywhere and everywhere in that old box as you call it. Regardless of space and time. " The Doctor helps Ian to escape the spikes. Vicki & Barbara are looking after Bennet who's collapsed. They want to set a trap for Koquillion but Bennet isn't keen. Vicki fetches water for their meal leaving Barbara by herself. Seeing a beast on the monitor screen she attacks & kills it with a flare gun it but it turns out it was Vicki's native pet Sandy. The Doctor & Ian, as they escape the tunnel, hear the noise and find their way to the Spaceship, Vicki & Barbara. 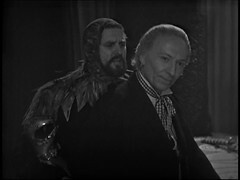 The Doctor goes to see Bennet, and is told, like Koquillion in the previous episode, that he can't come in. Vicki tells the travellers she left Earth in 2493: they tell her they came from 1963 and that The Doctor is a time traveller. The Doctor forces his way into Bennet's room and finds it empty: a tape recording provided the voice and equipment in their monitors Vicki's room. The Doctor finds a trapdoor in the floor and explores down the shaft underneath, closing the trapdoor behind him so that when the others follow him they can't find where he's gone. The Doctor finds himself in a temple like structure. 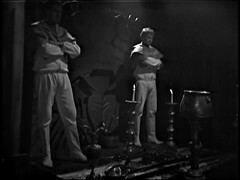 Koquillion arrives in the "temple", which the Doctor remembers as being the Didonian People's Hall of Judgement. He unmasks Koquillion as Bennet. He had killed a crew member on the journey and was arrested, but when the arrived on Dido he killed the crew. Vicki knew none of this and would have supported the story that Bennet had made up. He and the Doctor fight but two figures, native Didonians, step out the shadows and walk towards Bennet. He flees falling down a chasm. The Doctor passes out, waking in the Tardis. Ian & Barbara found him outside where the Didonians left him. 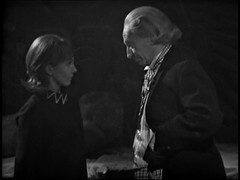 The Doctor explains what happened to Vicki who now feels as if she's got nobody. The Doctor invites her to travel with them. She, like Ian & Barbara before her, is astonished at the inside of the Tardis and leaves with them. The radio on the ship picks up a transmission from the rescue ship: seeking not to be disturbed the Didonians smash the radio. The Tardis materialises on a cliff top and falls over the edge. A bit more oomph to this episode than the first part, but it's transparently obvious who Koquillion is quite early on in proceedings which rather takes any element of mystery away the confrontation between Bennet and the Doctor is good as is the surprising appearance of the native Didonians. BARBARA: Doctor, why don’t you show me how to open the doors? DOCTOR: Hmm? Yes, yes, yes, my dear. Of course, yes, yes, how silly of me. Yes, number four switch. We learn a little about Vicki in this episode: her mother died, then she & her Father left Earth in 2493 with him taking a job on the the planet Astra. He survived the ship's crash but died when Bennet killed the crew and the natives. And that's about all we ever learn of her background! VICKI: They didn’t have time machines in 1963, they didn’t know anything then. So has mankind discovered time travel by the late 25th century? 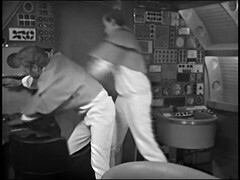 The action on Dido concludes with the natives wrecking the ship's communications system to protect their privacy. I wonder if, perhaps, they were responsible for bringing the ship down in the first place? Or was that another part of Bennet's mad plan? This is the first 2 part Doctor Who story, and the last until 1975's Sontaran Experiment. Three two parters are made in the fifth Doctor's era: Black Orchid, King's Demons and The Awakening, plus you can argue that the final two parts of Trial of a Timelord are a 2 part story in themselves. You can make a good case for it being a story length that the old series never quite masters, though I am quite fond of Black Orchid and The Awakening. Of course two old Doctor Who episodes are all but the equivalent of 45 minute new one! The Rescue was the last Doctor Who book to be written by Ian Marter, an actor (who we will hear more from later) turned writer, who died of a heart attack at the early age of 46. He wrote nine Target novels, second behind only Terrance Dicks. The Rescue's novel was released in August 1987 in Hardback and the following January in Paperback. The Rescue was released on video, paired with the following story the Romans, in March 1995. I always thought it would have made more sense to pair it with Dalek Invasion of Earth giving people two 4 episode tapes like Sontaran Experiment/Genesis of the Daleks. It was released on DVD paired with the Romans again in February 2009.